This year, the Tour de France delivers what it’s supposed to. All the various riders who have been off doing their own thing for the last couple of years all come together to face one another. Even better, there’s no one outstanding contender. Rather, there are four riders each of whom would normally expect to be out-and-out favourite and then a large support cast who could easily threaten them. The Big Four have all beaten each other at various points, but the appeal of the Tour is that it offers a certain clarity. As the biggest race of all, everyone is aiming to be in the best form possible and everyone is aiming to win. Who will? I’ve no idea. That’s why I’ll be watching. Chris Froome gets the column inches in the UK for being an English-speaker with a British racing licence riding for a British team. But is he the favourite? Probably not. He’s certainly capable of beating the other three, but since 2013, when he won pretty much every pre-Tour stage race he entered, he’s been much less dominant. Typically, his main strength over his rivals is his time trialling, which is basically irrelevant in a year when the only solo race against the clock comes on stage one. Alberto Contador is the one with the CV. Froome’s won one Grand Tour in his life. Contador’s won seven and had two taken off him for a weirdly-applied after-the-fact suspension. Most strikingly of all, he’s only ever failed to finish first in four of the Grand Tours he’s entered. This includes his very first and crashing out of the Tour last year. Another ‘failure’ came when he finished fifth at the Tour in 2011 after finishing first in that year’s Giro d’Italia. Having won this year’s Giro a couple of months ago, he’s again doubling up in a way few riders do these days. It’s a tall order. However, the way it usually works with Contador is that everyone thinks he’s not looking that good and says that he isn’t what he was, but then he wins anyway. Along with Contador, Vincenzo Nibali is one of only six riders in history to have won all three Grand Tours. I always think he’s the weakest of these four riders… but then he has won all three Grand Tours. He’s no charlatan. Nor is he a Charlatan. Confronted with the cobbles last year, Tim Burgess would have blanched and gone for a lie-down, but Nibali is a hard, unflappable man who exploits others’ weaknesses wherever they may lie. For Nibali, three hours of crashes represented an opportunity not a threat. What he might perhaps lack in physiology, he gains in attitude. The chances of the relentlessly blank-faced Nairo Quintana can best be summed up by his progress since his first Grand Tour in 2012. That year he finished 36th in the Vuelta. A year later, he was runner-up to Froome in the Tour. Last year, he won the Giro. He claims he’s not ‘a maximum favourite’ but notably, he finished stronger than Froome in 2013 and at 25, he is probably still improving. This is not the case with his rivals, the youngest of whom is Nibali at 30. Interesting fact: Quintana used to work as a nocturnal taxi driver in Colombia. In another year, or another race, many of these riders would be considered favourites. In a sense, the lack of top contenders in the 2014 Tour created a vacuum which was filled by new names, giving us a greater cast than normal this year. 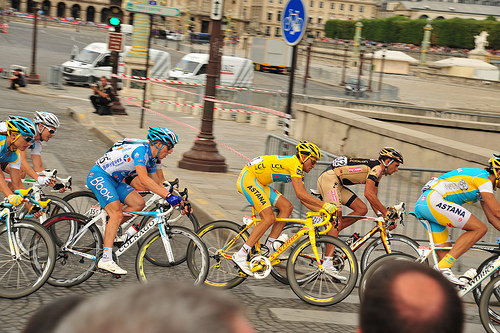 Old man Jean-Christophe Péraud, 38, finished second to Nibali last year. There was talk that despite his age he was still improving, but he doesn’t seem in top form this year and may end up offering support for Romain Bardet, another Frenchman. Bardet came sixth last year, but 14 years younger than Péraud, he’s most definitely on the up. Thibaut Pinot is likely to be top homeboy (maison-garcon?) though. He was third last year and seems to be a more reliable climber than Bardet. Spain gives us the familiar duo of Alejandro Valverde and Joaquim Rodriguez. In their favour is the fact that this year’s Tour is all about climbing. They can certainly do that. I may delight in characterising Valverde as perennial bridesmaid, but he’s won enough this year to be the world’s top-ranked rider. Like Valverde’s team-mate, Quintana, Rodriguez finished stronger than Froome in 2013 and no-one can sprint quicker uphill, but while the route suits him better than it normally does, he tends to lose a minute or two to the very best at some point or other. It’s easy to get carried away here and list everyone, but just a couple more names to keep an eye on. Rigoberto Uran has it in him to finish just off the podium, but riding the Giro may have dulled him, while Tejay Van Garderen is improving and carries hopes for the US. Then there are all the support riders for the major teams – the likes of Roman Kreuziger for Tinkoff-Saxo and any of Richie Porte, Peter Kennaugh, Geraint Thomas and Leopold Konig for Team Sky. Under different circumstances, these guys could compete, so they might suddenly gain status if someone above falls off their bike. Oh, and Dan Martin. Lord knows how he’ll get on but he’s almost always worth watching. By the end of the Tour, there will be a bunch of names in the top ten overall who you haven’t actually seen or heard of during the race. See if you can spot Robert Gesink, Haimar Zubeldia and Bauke Mollema at any point. You will of course spot website favourite, Laurens Ten Dam – he’ll be the one with a thick layer of spit in his beard during the time trial. Sadly, after that he’ll probably be riding with these guys.